This is a continuation and expansion of last week’s blog entry on (James) Chin Shik Kuey. 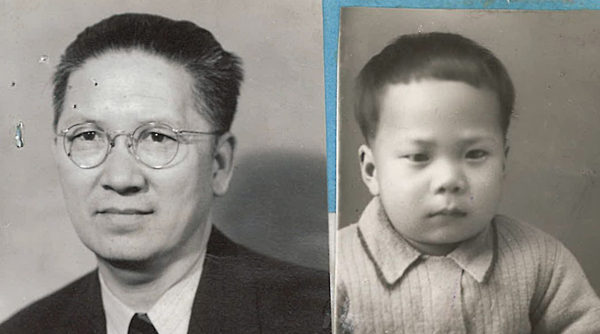 When Lily Eng gave her Uncle Jim a copy of his file, he told her that Marie A. Proctor, District Commissioner of Immigration of the Seattle District, was his godmother. 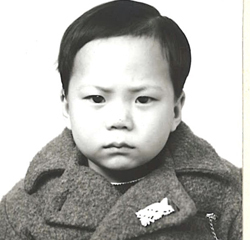 This is what happened: In 1940, three-year-old Jim came to the U.S. with his father’s business partner. His father, Chin On 陳安, wanted him in the U.S. quickly because of growing fears of war. Once Jim arrived at the Port of Seattle, his father came from Yakima to the immigration office to pick him up and met Marie Proctor. It isn’t clear how or why it happened but at some point after meeting Mrs. Proctor, Chin On asked her if she would be Jim’s godmother. Maybe she was as taken by how cute Jim was in his little overcoat in the photo for his Certificate of Identity application. “Photo of Chin Shik Kuey, Form M143,” 1940, Chinese Exclusion Act case files, RG 85, National Archives-Seattle, Chin Shik Kuey case file, Seattle Box 807, 7030/12930. 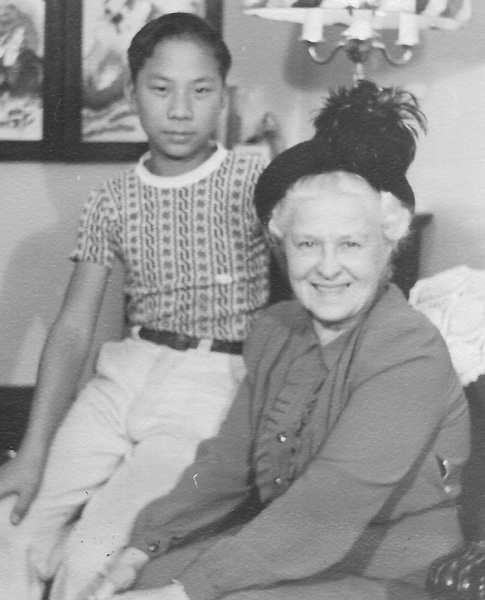 As Seattle’s District Commissioner of Immigration, Marie A. Proctor’s name appears in almost every Chinese Exclusion Act file from 1934 to 1940 but no personal information or photo of her is included. Jim Chin (Chin Shik Kuey) gave these photos to his niece Lily Eng, Data Entry Volunteer, for the Chinese Exclusion Act files at the National Archives at Seattle. 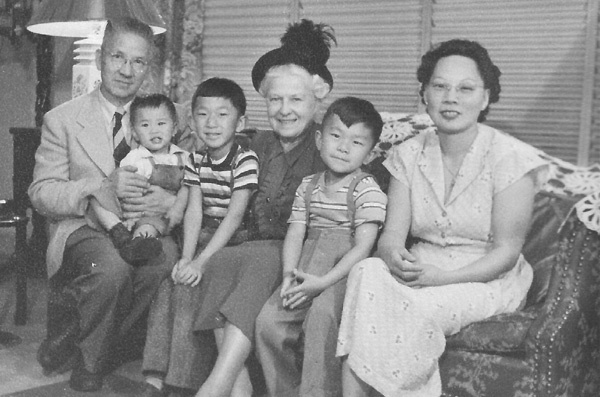 Jim’s parents: Chin On and Wong Yoke Lon: brother Kim Chin, brother Don, Marie A. Proctor and an unidentified toddler. 1.“Woman Appointed,” Bellingham Herald, Bellingham, WA, 17 January 1934, p.1 & 5; (https://www.genealogybank.com : accessed 29 April 2018). 2.“Marie Proctor Finishes Job and Leaves City,” ,” Seattle Daily Times, Seattle, WA, 30 June 1940, p.3; (https://www.genealogybank.com : accessed 29 April 2018). 3. “Capt. Proctor, Former Skier, Dies in Crash,” Seattle Daily Times, Seattle, WA, 3 Dec 1944, p.8; (https://www.genealogybank.com : accessed 29 April 2018). 4. “Robt. L. Proctor Called by Death,” Seattle Daily Times, Seattle, WA, 329 June 1945, p.24; (https://www.genealogybank.com : accessed 29 April 2018). 5.“Mrs. Robert L. Proctor,” Seattle Daily Times, Seattle, WA, 13 Sept 1964, p.65; (https://www.genealogybank.com : accessed 29 April 2018). Chin On 陳安 made a trip to China in November 1935 and upon his return in June 1937 he claimed his son, (James) Chin Shik Kuey, was born on 2 January 1937 at Wah Lok village, Hoy San, China. In November 1939 Chin On swore in an affidavit that he was born in Seattle, resided in Yakima, and was in the restaurant business. He had made six trips to China since 1893. His intention was to bring his son, Chin Shik Kuey, to live with him in Yakima. The affidavit contained photos of Chin On and his son. He was seeking admission for his son with the status of son of an American citizen which would make him an American citizen in his own right under Section 1993 of the Revised Statues of the United States. “Affidavit Photos of Chin On and Chin Shik Kuey,” 1939, Chinese Exclusion Act case files, RG 85, National Archives-Seattle, Chin Shik Kuey case file, Seattle Box 807, 7030/12930. At the age of three, Chin made the trip from his village to Hong Kong with his father’s Yakima business partner, Ng Mon Wai, and his wife. From there they boarded the (Empress of Asia) Princess Charlotte and arrived at the Port of Seattle on 13 April 1940. Chin was admitted three days later as the son of Chin On, a citizen. Since James was so young the interrogators only asked him his name and then quizzed his father. Chin On, marriage name Dee Bon, was 52 years old and born in Seattle. He was the cashier and buyer for the Golden Wheel Restaurant in Yakima, Washington. He had four sons with his first wife. They were Chin See Wing, married and living in Ellensburg; Chin See Chong, married and living in Yakima; Chin Fon Yung, married and attending school in Yakima; and Chin Moy On, age 11, attending school in Ellensburg. The wives and children of his three older sons were living in China. Chin On claimed the mother of Chin Shik Kuey died in 1939. Chin On planned to take his son, who he now called James, to Yakima and hire a nurse to take care of him until he was old enough to go to school. Ng Mon Wai, marriage name See Suey, was a witness for James Chin Shik Kuey. Ng was a merchant and manager of the Golden Wheel Restaurant. He and his wife brought the boy on the ship from China to Seattle. Ng Mon Wai’s wife, Chan Yuen Mui, also testified. Her status for entering the U.S. was as the wife of a merchant. She was not interested in caring for a three-year old child and did not interact with James on their voyage to Seattle. 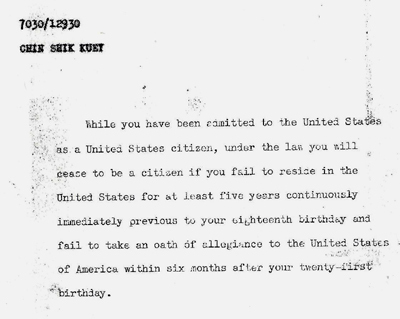 Chin Shik Kuey was admitted to the United States as a U. S. citizen, son of Chin On, a native. The notice of his admittance into the United States was signed on 16 April 1940 by Marie A. Proctor, District Commissioner of Immigration, Seattle District. Chin Shik Kuey’s finger prints were included in the file with this cautionary note. “Form M-490,” 1940, Chinese Exclusion Act case files, RG 85, National Archives-Seattle, Chin Shik Kuey case file, Seattle Box 807, 7030/12930.